House Democrats elected Todd Prichard as their new minority leader this afternoon. The Democratic legislators gathered in Des Moines at the Statehouse for their post-election caucus, choosing their new leadership group for the next session after Mark Smith decided to not run for reelection for the party’s top spot in the House. Democrats also elected Jo Oldson of Des Moines as the Minority Whip, a new position they hadn’t had in recent years. The new assistant leaders are Wes Breckenridge, John Forbes, Brian Meyer and Sharon Steckman. “House Democrats are ready to get to work in January to improve the lives of everyday Iowans. We know that Iowans are tired of the divisive, partisan politics that defines our system today but it should not be that way. 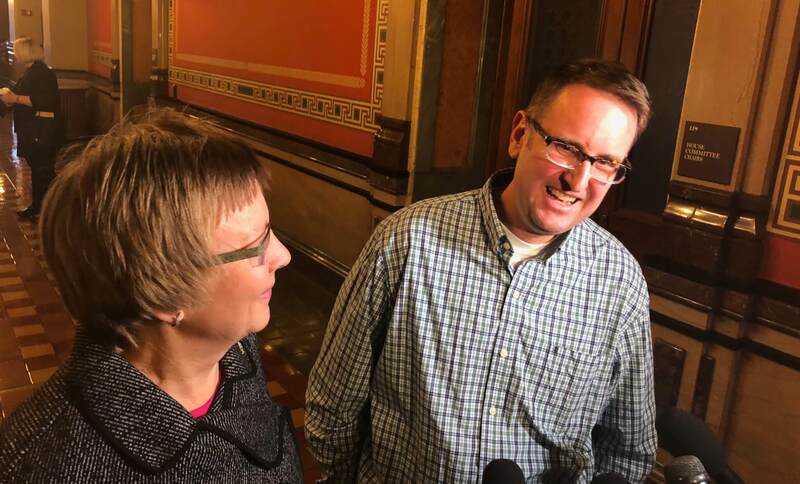 We believe it’s time to put politics aside, listen to Iowans, and do what is best for people again,” Prichard said in a statement. Many Democrats cited Prichard’s experience in the Army, where he served a tour of duty in Iraq, and as a rural legislator as key to helping the party make inroads into parts of the state that Republicans have dominated in recent years. He also grew up in a working-class neighborhood in Davenport. Prichard won a special election to House District 52 (Floyd and Chickasaw counties) in 2013 and has represented the rural district ever since, despite Republicans carrying it by large margins at the statewide top-of-ticket level. He mounted a brief run for governor in 2017 in the Democratic primary, but a lack of funds and a crowded field forced him out early. Democrats picked up a net gain of five seats in the Iowa House during the 2018 election. They swept seven Republican-held seats in suburban districts, but lost two of their own in Fort Dodge and Fairfield. A recount will occur in Decorah’s HD 55, where Democrat Kayla Koether trails by just seven votes. Recounts in Iowa races, however, rarely change many votes. The Legislature will reconvene in January with Republicans holding full control over state government once again. Republicans’ margin in the House will be narrowed to 54 – 46 this year, meaning just a few defections could torpedo some of the most-conservative bills. For more information on Todd Prichard, see some of our prior stories here, here, here and here.